I discovered a really perfect product! Before the winter leaves, I had to do the posting!!!! Sole posting! Last few days, I was in Kangwondo about 4 days. But, I failed to do it due to the trip! I brought my lap-top computer…but, I tried to forget about the works. As soon as I arrived there, I had no thoughts in my head. After I arrive Seoul, I just lied. Right after waking up, I took pictures quickly. I really didn’t know that. I don’t enjoy using MAKEUP FOREVER products. In the middle of December, Chungdamdong MAKEUP FOREVER was on sale before closing. I just visited there and I met this product. It’s in the thick glass, and this foundation contains 80% of water. This is a real water foundation, water-glossy foundation! This is the most watery product among other products on the market. It’s the best thing which helps your skin watery and skin modification. I didn’t tell anybody this one…. There were so many questions about these things for a long time. And not so much oily? Every time they say, I noticed it. The really watery foundations always have much oil & water. They’re different from just chemical watery foundations. Those products are not close to the makeup products but close to the skin-care moisturizer. If there’s much oil & water, the particle which covers is little. But, how! does it have a good coverage? If you’re too much greedy, you’re just going to search for something during the life. Sometimes, you have to give up something. Then, it’ll be easy for your to upgrade the lifestyle. As you know, this product’s coverage…oh, my god!!!! but I just apply this product only with my hand. Also, I recommend the use of hand. If you tile the bottle a little, the contents will be flown. It’s a real watery foundation….Just, water foundation! So, it’s very easy to apply it! Instead of the easy way, don’t apply the product through using your whole hand. Before using it, I always shake it. so I could hear the sound of the water. If it sounds weird, I do the pumping…to my fingers. The content is watery, so there’s no problem with crumpling. It’s really watery as soon as it touches your skin. It’s applied apparently like a skin care product. I applied the product thinly to your face… and applied again to the front-cheek. Honestly, there’re not many skins covered with blemishes or troubles. Don’t cover your skin thickly in order to cover a little blemishes or troubles! You don’t have to care the part of good skin. I applied it to the front-head with 2 layers…and applied it to the front-cheek with 6 layers…6 layers! I applied it densely by using my hands, repeated this process again. Of course, I’ve never applied other foundations repeatedly. In other words, this product has a weak covering power. But! It takes the makeup well. It made me feel light during the day. The more water, the better. Layered foundation was kept for a long time. I thought it would disappear soon. That’s why I brought the heavy bottle…and I went out. I didn’t have to apply it again. There’s a difference of sustaining power depending on the skins. People who have dry skins…it’s hard to take the makeup well without troubles. Like this season…skin makeup easily doesn’t take because of the indoor temperature. If you look at the mirror in the afternoon…the oil & water already disappeared. You’ll see only foundation particles…it looks like the dead skin cell coming out. I also experience it even though I don’t have a dry skin. Everywhere I go is dry…so I can’t avoid the dryness. However, this product was different…it was perfect. The dry feeling gets serious as time goes by, but it looks okay. It’s surprising…! The moisture is not caused by the oil…because the skin doesn’t look oily…I can believe the 80% of moisture said by MAKEUP FOREVER. Frankly, the moisture goes away gradually. I also have to cover many things on my skin. If this product is only watery with no covering power, I cannot use it. But, it covers finely when you apply it repeatedly. Also, it’s not thick although you apply the product again & again. It doesn’t take long time to apply it by using your fingers. It’s not that different from applying the foundation by using the brush or sponge. I like going out with the naked face. So, I guess this product will help me to live politely in 2011 year. I can save my face lightly, lightly. Of course, I recommend the watery-dry-foundation to the people who have dry skin…If you have too much troubles to cover, just pass~! But, dry & good skin…use this product!!! You could cover soft and small blemishes. If you have troubles in coverage, apply the watery foundation and cover the blemishes with a concealer. Neural or oily skin…If you look for the watery foundation…I strongly recommend it! You have to find the best product to maximize your good skin. You have to make your skin more natural….light….clean. Regardless of the skin types, are you suffering from the tore skin? Not only skin care also watery foundation is essential things for modifying makeup. Additionally, it’s really good to mix the high-price/dry foundation with watery foundation. If you’re going to use both products by the end, they’re good investments. These days, I only use this product and sometimes mix with other foundation. How can I imagine the winter life without it? Then…how the driest skin people can live in winter without watery foundation? My teacher who has the driest skin loves this product. Of course, she feels dryness in the heated indoors even though she applies this product. However, only you could feel the dryness by yourself and I observed her skin personally. But, her skin looks really watery and glossy. She’s still feels the dryness, but satisfied with this product because it’s really watery compared with other products. There are seven colors. I’m using the brightest color of no.20. If you’d like to give a little more coverage, it’s okay to have a test no.22. No.20 and no.22 are ‘beige’ base close to the skin color. So, you could complete super-natural makeup. If you have some reddish things, use the beige base! If you want a little brighter feeling, there are no.1&2 of ‘pink’ base. It attracted me with the brightness… I just picked no.20 on sale. After I finish this one, I’ll test the dark color and buy it. Even if you use the Korean foundation no.21 & 23…you could use the brightest no.20 on your good skin. It’s not watery…and it doesn’t have the power of coverage…your skin looks clear. Maybe, you remember the LUMINOUS MOISTURIZING of BOBBI BROWN as a watery-glossy foundation. When the watery-glossy foundation was popular…famous…how about comparing it with the representative LUMINOUS of BOBBI BROWN? First of all, I think MAKEUP FOREVER is better than MAC FACE&BODY. I don’t apply this kind of product to my body…so I have nothing to say…When I apply this product to my face, it’s more watery and vivid. Of course, there’s no rivals of MAC product’s incredible capacity^^ But, it’s hard to find the Mac’s. MAKEUP FOREVER products are about $20 cheaper than BOBBI BROWN’s products. The ratio is…30:50…If you think about the repeated application, MAKEUP FOREVER’s capacity is not in the superiority. Then, there were many people who gave up the LUMINOUS because of its low power of coverage. 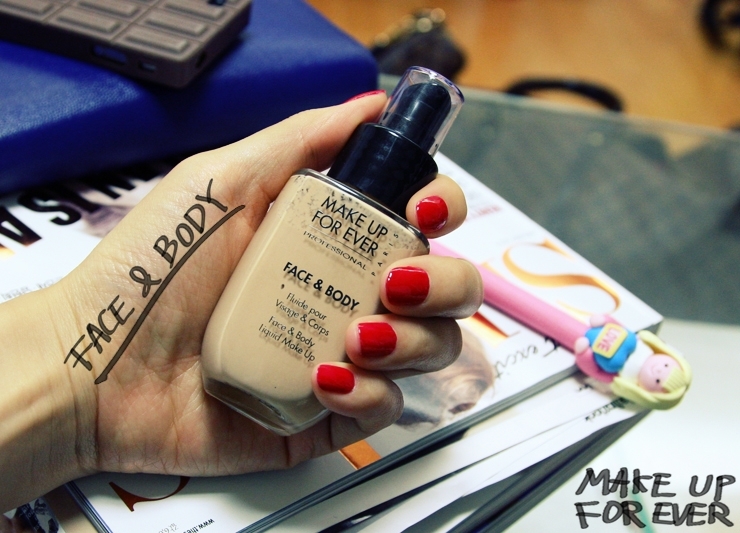 MAKEUP FOREVER and FACE&BODY have lower power of coverage than BOBBI BROWN. But, they show more watery skin than BOBBI BROWN’s watery-glossy foundation. I was a big fan of LUMINOUS, but I avoided using it because much trouble came out. Lately, I got the LUMINOUS and I applied it. I was really surprised at it. It was watery even though it had low power of coverage…but, the skin doesn’t take it. Of course, it could be because I used MAKEUP FOREVER product…Certainly, it’s impossible to apply the LUMINOUS in this season. My neighbors would feel it. I emphasize on it. The power of coverage will be strong, when you apply it repeatedly. But, it doesn’t show the identical effect compared with a general foundations. I’m not responsible for it. You must have a test before purchasing the product. If you have a good skin, don’t hesitate. It’ll be a reliable product which prevent from the heating. I’m going to write the replies for the last posting…there were many inquiries of hair. My hair grows so quickly. I already cut bad hair…haha. I’m showing off that the growing speed of the hair. Sadly, I used the curling iron to make curls. It’s really hard to meet that kind of curl with only perms. I’m getting cares once a week. I didn’t do the perms quite a long time. As I said, I dyed my hair with the neutral hair-dye. You’ll see the ample hairs by making curls with a dry. My hair’s really thin and I don’t have much hairs. My hair is not elastic, so the curls easily get down. I dyed my hair darkly to show the elasticity with the lights. That’s why the models come out with dark hairs on shampoo commercials. Anyways, all the things came from the power of hair-drier. Nowadays, I don’t do the perms based on the fact. Generally, hair designers make excessive curls in hair shops. Make the thick curl by giving a little ridge…don’t create consistent curls…tell them like that. Of course, you look for the shops where make a good style that you want. You just have to decide it based on your individual preference. In general, you have to pay about $80 for the perms in Gangbuk shops, but you have to pay about $120~180 for them in Gangnam/Apgujeong…in Chungdamdong, you must pay about $180~500, 600, 700…! The price for dry …maximum two-times? I recommend do the hair-dry when my friends go to the interviews or important events. When I have the time, I sometimes choose the style for them. If they need to cut, they have to cut the hair first.